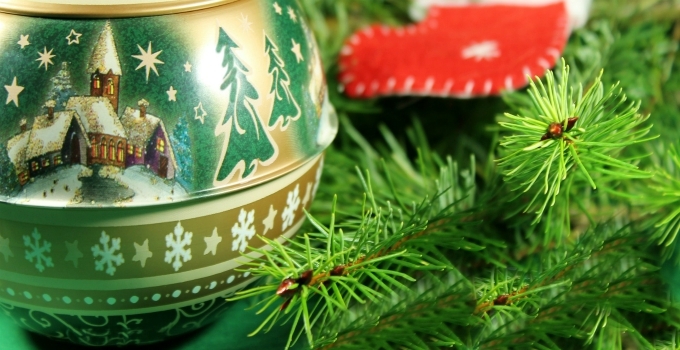 Edible Wild Food Blog » Recycle Your Christmas Tree – Drink It! This year, and every year, when you are out looking for a Christmas tree be sure to look for one that has not been grown in a chemical cocktail. Why? You can capture all the amazing nutrients your tree has to offer in either a beverage or in baking. Yes, you can eat or drink your tree after Christmas and your health will benefit from it! Pine needles are loaded with alpha and beta carotene and vitamin C, and it doesn’t end there. The vitamin C levels are so high (on average 5 times greater than lemons) you won’t need to be eating oranges anymore. We’ve all heard about the power of resveratrol – pine needles have it! They also have quercetin, flavonoids, tannins, pine oils, anthocyanins, proanthocyanin and much more. Vitamin C and proanthocyanin are considered to be important in preventing cancer. Pine oils, according to Russian studies, is useful to control the weight, lower cholesterol and in lowering the blood pressure. Proanthocyanin and resveratrol are potent anti-aging compounds. White, red, Scots and Jack pine all make a great tasting tea. So does blue, white and black spruce as well as fir. To make tea, use some fresh needles, or use one teaspoon of powdered conifer per cup of boiled water that has cooled for 5 to 10 minutes and infuse twenty minutes. Cooling boiled water is important so not to destroy some of the nutrients. Take the dried needles and powder them in your blender or grinder. Store the final product in a mason jar. Use this powder to add a lemony taste (yes, there is a lemon-taste to these) to your cooking – fish, chicken, and even in some of your desserts! You can make pine cookies, pine muffins, or anything else you feel could use the wild touch! Oh – and be sure to add some to your smoothies as well! Place some needles into a mason jar one quarter full; add olive oil until all the needles are covered. Let infuse for 3 weeks (out of direct sunlight), then strain. You can use this to make salad dressings or to cook with. Fill a mason jar with finely cut up organic lemon with the peel and pine needles. Pour honey into the mason jar until the jar is filled. Cover and let sit for 3 weeks. Strain and decant. This is an amazing syrup which can be used as a beverage or trickled over ice cream and it tastes great. Some people use this as a cough syrup due to the healing power in honey and the high content of vitamin C in the pine needles. Cedar is best when dried and stored to be used for tea. Many people use fresh cedar when making tea and this, if done frequently, can cause irreparable harm to your kidneys. Cedar contains volatile oils that dissipate once dried so having this fresh should only be in a survival situation. Your tree can be a whole lot more than just a wonderful centerpiece. Remember, when Christmas is over, your tree can be a fabulous source of minerals, vitamins and other essential nutrients your body needs. wow – that’s amazing & great to know. I’m wondering about the residual pesticides that might be present in trees that are grown for christmas – if they aren’t raised for agricultural reasons, are there any statutes about what can be used on them? also, how can you tell what kind of tree you have? I guess one can always ask the vendor. thanks again – great information. This is a great idea. Would distilled water be better for the brewing/steeping/infusing than filtered water? This is great. Are you worried about how the trees are treated? I have read warnings about using roses from florists because they don’t care about using food-grade chemicals or not. I imagine the same issue could apply to Christmas trees. Frances: Whatever water you normally consume is fine. I’ve even used O2 water (this water helps to fight cancer as it has an extra molecule of oxygen! Where I live, our water is from an aquifer so I mostly use my tap water. My favourite ‘conifer’ tea is cedar! I have cedars in my backyard so I don’t need to go far! Paul: Unless you know where exactly your Christmas tree came from, you can’t know about pesticide use. There are lots of coniferous trees around though so going to a nearby forest can do the trick! Here is a link to tree identification in Ontario… most of these conifers are located across Canada and the U.S.
Hemlock, Larch, Tamarack and Yew – DO NOT take these!! I do not have enough information at this time to know if they are edible. I think Yew leaves can be (not the berries) – but to be safe, stay away from these! Paul you have me laughing (and you’re welcome)! You raise a valid point – do not ingest artificial Christmas trees!!! It is very interesting, I have learned a lot, thank you. It is a wonderful idea, I will try it. I buy Spruce beer, but it is not always very natural, but this is very natural and I am sure it is delicious. Keep up the good work and Happy New Year to you and your readers. Thanks for reprinting it. I referred to it in my blog about eating Christmas trees, and posted some recipes for cookies, tea and infused vodka Would love to see more recipes using these greens. I believe some of the “Plum Yew”s have edible fruit. I don’t, offhand, know latin names, but try searching for “Japanese Plum Yew” and “Chinese Plum Yew”. I have 3 planted, but they are not big enough to fruit yet. They tolerate dry shade (! ), so are valuable plants in my area! And they’re evergreen, too. i knew that you could eat douglas fir needles but i didnt know you could do that. thanks i think ill try that. never eat taxus baccata needles (european/ english yew)! i don’t know for any other species, but on this one only arilus (red pulp around the seed) is edible, but the seed itself is poisonous, as the rest of the tree. Many trees have fire retardant sprayed on them, and it is not organic! Love this article, thank you! All parts of the yew commonly used for landscaping are poisonous, except for the red part of the fruit. That is delicious, but spit out the seed. Hemlock needles are not poisonous and can be made into a nourishing tea. Don’t drink a ton of it though, as it is very astringent. Larch/Tamarack is also safe to use internally. A wonderful book I recently discovered is The Healing Trees by Robbie Anderman. Worth getting! It has information on the uses of many trees here in the NorthEast. Do you have more ideas for cedar needles? I have a lot of dried cedar needles. Tea baths ? What is nutrient content? I do but far too many to write here. They are great in our drawers as sachets. Teas and tea baths of course! Depending on the cedar depends on the nutrient content. All share high quantities of vitamin C!